BULAWAYO, Zimbabwe, Feb 23 2016 (IPS) - Sijabuliso Nleya has been kept busy in the past few weeks digging up sand. He is not a sand poacher like scores of people who local district councils across the country say are digging along dry river beds for sand used in the construction of houses. “The situation is terrible,” said Nleya, who owns a plot in Douglasdale, a small farming community on the outskirts of Bulawayo. Together with other men, he has been filling up dry wells and boreholes, as groundwater increasingly becomes an unforeseen casualty of climate change, thanks to the absence of rainfall for long periods across the country. “The dry wells have become dangerous when in the past they were a source of our livelihood. It’s better to fill them with sand than dream that they will provide us with water one day,” Nleya told IPS. Underground water sources sustained farming activities here earlier with maize, tomatoes, cabbages and a range of vegetables, including paprika, being sold in the city. “Only a few boreholes now are functioning and we have watched our source of income evaporate,” he explained. Zimbabwe has always considered irrigation fed by groundwater as the bulwark against low rainfall, but the climate ministry says thousands of boreholes have dried up across the country, putting a further strain on the poorly funded agriculture sector that has long relied on the rains. In Bulawayo, hundreds of community gardens that provide economic safety nets for low-income households use borehole water. Now, with thousands going dry across the country, authorities have raised concerns about the far-reaching implications not only for incomes but health, especially as HIV/AIDS patients rely on produce from these gardens for their nutritional requirements. According to the environment, water and climate minister Oppha Kashiri, more than 12,000 boreholes across the country have gone dry, in a country that is experiencing its worst drought in recent years. “Our water sources are drying up in all the seven catchment areas,” he told journalists on February 4. President Robert Mugabe has declared drought as a national disaster as more than a quarter of the population face food shortages. Aid agencies report that up to 2.5 million people require food assistance.” The agriculture ministry says up to 90 per cent of the rain-fed maize crop planted last year has been a write off. According to the Southern African Development Community’s groundwater and drought management programme, up to 70 per cent of the population in the region relies on groundwater, and in a 2015 assessment noted that climate change was exacerbating the groundwater crisis. 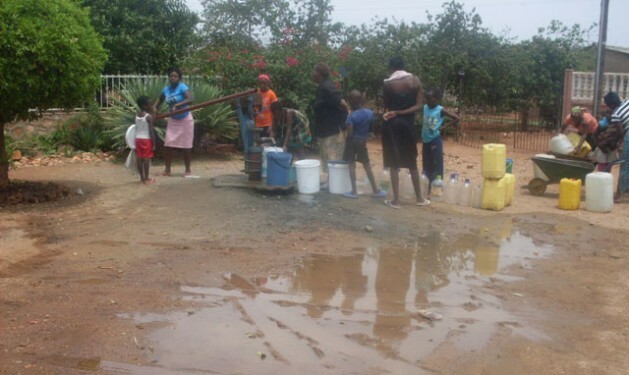 The Zimbabwe National Water Authority (ZINWA), a government department under the water ministry, says up to 70 per cent of the population resides in the rural areas where the primary sources of water are boreholes and wells. Scarcity is now forcing humans and livestock to share water sources. More urban residents are using groundwater. Although the drilling of new boreholes is banned, the haphazard sinking of boreholes continues and is exhausting the water table. “It is vital to highlight that groundwater is a very finite resource which can easily run out if there is no balance between replenishing of groundwater stock and extraction,” warned this agency. “Due to increasing water shortage and the growing reliance of urban communities on borehole water, minimum groundwater utilisation standards have been disregarded and this has seen a prompt decline in the water table with boreholes in some suburbs dying,” the water authority added. Nleya and millions of subsistence farmers, residents and villagers, who rely on groundwater, are the human face of the ravages of climate change. “We never thought water could actually disappear in the ground as we have always had functioning boreholes and wells, we hope we get rains soon,” he said.